1/2 cup fresh cilantro, chopped. Extra to garnish. Extra Sea salt and crushed red pepper flakes to garnish . Preheat oven to 350F and oil a 8×11 baking/casserole dish. Set aside. Slice your plantains in half, lengthwise. Fry them on medium high in 1/2 tbsp oil (or butter) until golden brown. About 2-3 minutes per side. Set aside. In same pan add your chopped onion, chopped bell pepper, and Adobo seasoning or sauce. Saute until onion is fragrant. Around 3-4 minutes. Add sausage meat, tomato sauce, olives, cilantro, and apple cider vinegar. Mix all together. Cook on medium heat for 2-3 minutes. 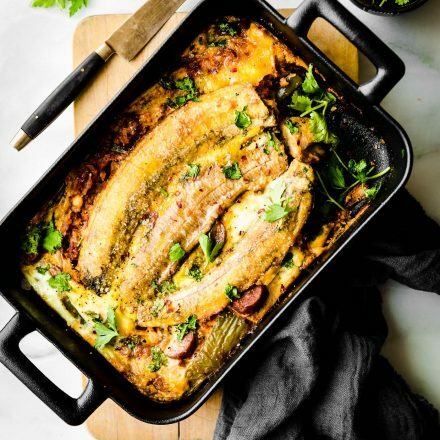 Layer ½ of plantain in small casserole dish. Add meat and veggies. Layer again with rest of plantains. Add whisked egg on top. Sprinkle with sea salt and pepper and optional red pepper flakes. Garnish with cilantro, lime wedges, salt/pepper to taste. Optional add-ins to replace meat – 8 oz beans, ½ cup more chopped cauliflower or chickpeas. If you don’t have adobo sauce or seasoning, you can use a spicy chili sauce (no additives) or make your own by combining 1 tablespoon tomato paste , 1 tablespoon apple cider vinegar, 1 teaspoon chipotle powder (or smoked paprika/cayenne powder mix), 1/2 teaspoon cumin, a pinch of oregano, a pinch of garlic powder, and a pinch of salt. Estimated Nutrition Per Serving based on using sausage.